I hate falling behind on my updating this blog, but as I've said many times before, life sometimes just gets in the way. Though I still carry a considerable passion for food, cooking sometimes just seems to take a little too much energy, especially after a difficult or busy week at work. Well, not all cooking. New things. I've eaten plenty of home-cooked meals in the past few months--to the point of having to occupy an additional inch or so of the sofa now, in fact. I just haven't had the time to look through recipe books to find something new that I wanted to cook. But that's okay. There are plenty of old, tried and tested recipes in my head that I still haven't posted here so at least they're new for the blog. Like this delicious mango salsa. 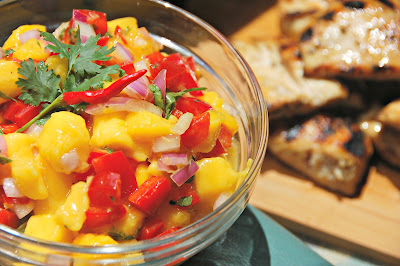 Now, most of the time, people just add a bit of onion and tomato and call it mango salsa, but I find that the slightly spicy flavours of the peppers, chili, and coriander actually compliment the sweetness of the mango a considerable lot. The lime is a must, as well! Guess how easy it is--yup, mix it all up and you're good to go! Goes fantastically well when wrapped in a tortilla with slices of salt/pepper marinated grilled chicken. Try a lime and onion marinade for the chicken too!